MUMBAI: Traditional methods of marketing , though still prevalent , are not the sure shot way to reach the right target audience , especially for the Small and Medium Enterprises (SMEs), for whom money is always a constraint. It is imperative to not only be there where the customers spend most of their time but also communicate in a language best understood by them. And for the SMEs, which plan to grow at a rapid rate, ignoring the World Wide Web is a mistake that they cannot afford to make. Connecting with the customers is a pre-requisite for any business and there is no better way to bond with the customer but marketing through the Internet. While there are a lot many tools to choose from, they all aim at making the right connect with the customer base. The Internet is a great equalizer and a great boon for the small and medium businesses, feels Dr. Shyam Vyas, president and managing director , Shyam Vyas Marc Pvt Ltd.
Kumar opines that the traditional marketing methods are becoming both ineffective and expensive , and by neglecting to market their business online, the SMEs are missing out on the powerful business results that an effective internet marketing strategy can bring about. Similar views are expressed by Vyas who feels that those not using internet marketing are losing out on the opportunity to reduce costs and be more responsive as an organization. According to a survey jointly conducted by Internet and Mobile Association of India (IAMAI) and estates India, 73 per cent of MSMEs in India have their own websites, while 99 per cent of MSMEs use online B2B marketplaces to generate business. The survey found that in the domestic market last year, the surveyed companies generated 4,842 orders and business worth Rs 50.9 crore through B2B emarketplaces, while in the international market the companies recorded business worth Rs 15.9 crore generated from 1,428 orders through e-marketplaces. If there is one thing that reduces customer risk perceptions – it is communication . And there is no other channel more popular than social media to do so. Social media provides a platform for direct communication between SME customers, prospects and employees. What is more, it is a key driver of content distribution and brand visibility online. 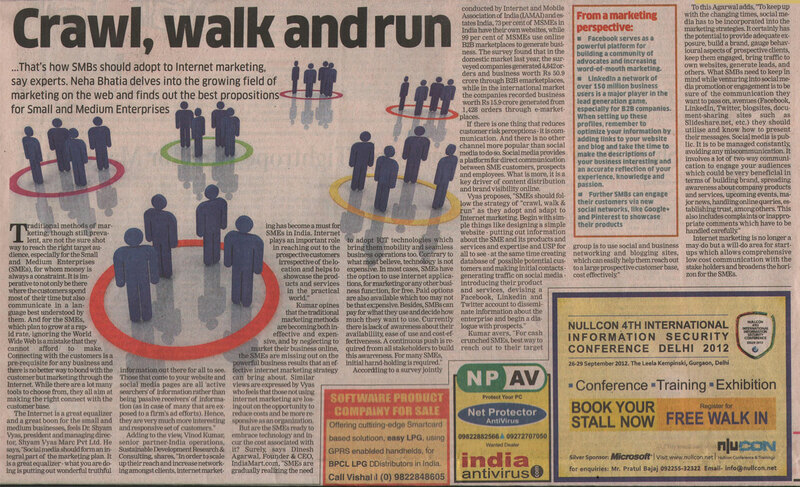 Internet marketing is no longer a may-do but a will-do area for startups which allows comprehensive low cost communication with the stake holders and broadens the horizon for the SMEs. Facebook serves as a powerful platform for building a community of advocates and increasing word-of-mouth marketing. LinkedIn a network of over 150 million business users is a major player in the lead generation game, especially for B2B companies. When setting up these profiles, remember to optimize your information by adding links to your website and blog and take the time to make the descriptions of your business interesting and an accurate reflection of your experience, knowledge and passion. Further SMBs can engage their customers via new social networks, like Google+ and Pinterest to showcase their products.